This time of year is particularly grey isn't it? There's hints of colour starting to appear in the garden, even in my garden, but generally its the greyness that starts to pervade our daylight hours. For someone who loves colour, I find this hard, so when I get a chance to absorb colour I take every opportunity. Sometimes that's an outfit, last weekend it was an orange skirt and top, with a black lace overtop to tone it down a bit (as I know not everyone does colour) matched with a pair of red sparkly shoes. Other times it's a blast of colour wherever I can get it. After seeing the butterflies in the glass house at Wisley on Sunday, our next stop was the Alpine House, and another blast of colour. 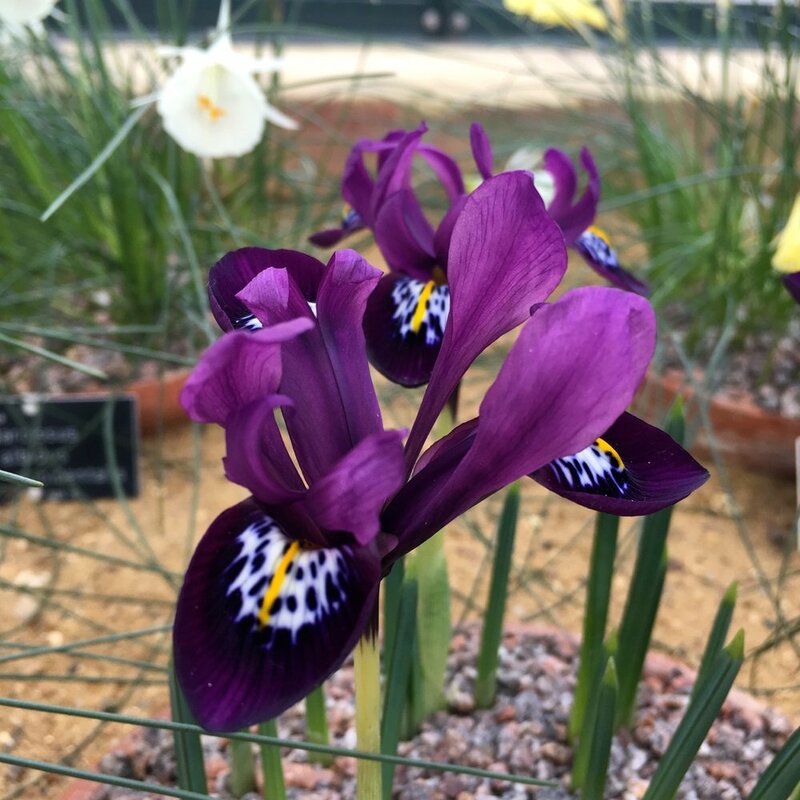 These small flowers - irises, narcissi and muscari - pack a lot of punch. Spring has a tendency to deliver plenty of blue and yellow flowers so it was great to get an advance shot of all of these colours, especially the grape hyacinth, or muscari. I'm hoping mine make an appearance soon. I am starting to spot crocuses around on my way to work and from the office window as there's a patch outside the National Maritime Museum in Greenwich where a yellow carpet of crocuses is starting to appear. I've not seen any quite like the ones below though, they're almost striped aren't they? I felt better on Sunday for having seen some colour, and even writing this post after a manic few days at work I feel better all over again for seeing the photos. I'm sure each of us have mechanisms for coping with the grey, what's yours?